Paleo Butternut Squash Lasagna is one way to sneak more veggies into your life. Disclaimer: nothing can take the place of real noodles. However, if you’re willing to put that aside, this paleo butternut squash lasagna recipe is pretty awesome and will get you close to a lasagna-like dish without any gluten or dairy. Win! I’m currently back in Scotland visiting, and a trip to the local Tesco to get ingredients left me with zero options for pre-made sauce that did not contain any excess sugar, so I looked around and gathered some staples to make my own. If you can find a clean pasta sauce, by all means go ahead and use that which means you’ll save time and omit the tomato sauce, paste, and oregano. I also used lean ground pork, but beef or lamb or a combo of different meats would be tasty as well. Serve this with my Simple Garlicky Greens for a complete meal. 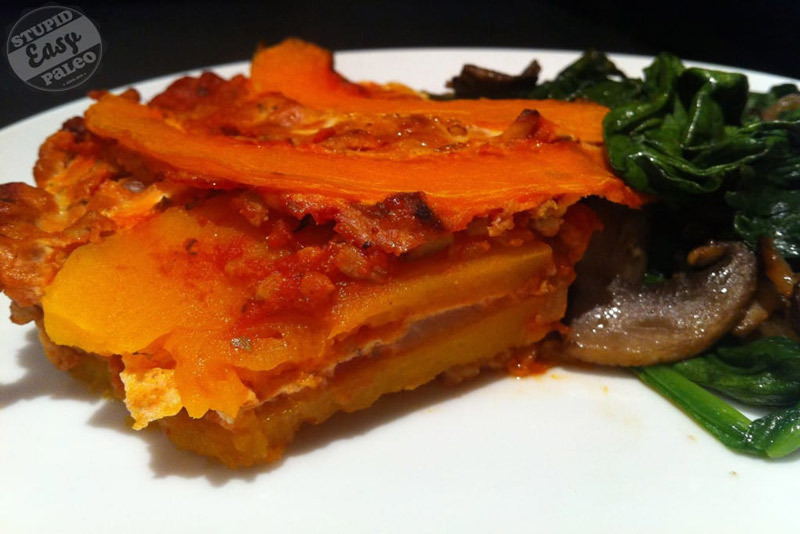 Paleo Butternut Squash Lasagna is a gluten-free and paleo take on a classic dish. It's a simple way to amp up your veggies. Layers of butternut squash stand in for noodles, and they alternate with a homemade sauce and savory ground pork. In a large pot over medium heat, sauté the diced onion in a spoonful of coconut oil until it’s softened, about 5 minutes. Add the pork, garlic and oregano and raise the heat to medium-high. Saute until the pork is cooked through. Peel the butternut squash. Slice into very thin rounds by laying the squash on a cutting board. I tried to make mine about ⅛” thick. The key is to make the slices as uniform as possible so they cook evenly. You could also use a mandolin to make them evenly sized. Be sure you have a sharp knife! Other recipes call for the squash to be sliced lengthwise into long sheets but this is very hard to do with a knife. The rounds enable quicker prep time and the result is just as tasty. Now it’s time to prepare the lasagna: start with a bit of sauce to cover the bottom of the dish. Then place the squash in a single layer (I used small pieces from the bottom of the squash, which I had to cut into half moons to remove the seeds, to fill in the gaps between the rounds). Now add another layer of sauce. Don’t skimp because the moisture from the sauce is what cooks the squash. 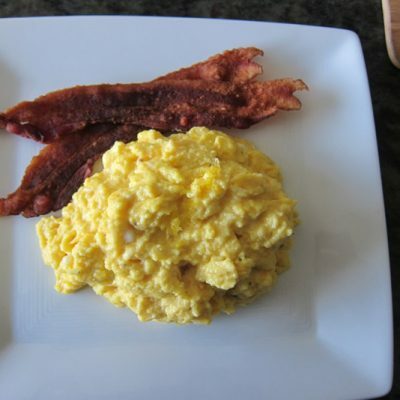 Now add about ⅓ of the scrambled egg and smear it around. It will look gross. Stay the path. It’s going to taste awesome and gives the appearance of cheese. Repeat the squash-sauce-egg sequence one or two more times, depending on how much you have left. (I used two 9″ round pans so each ended up with two layers). Finish with a light layer of sauce. I also used up some of the extra pieces of squash as decoration. Bake for about 25-30 minutes or until a knife easily pierces the squash. 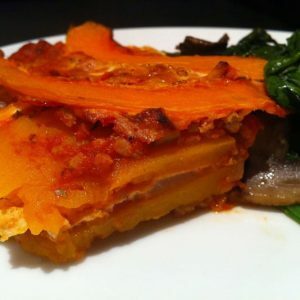 Questions about this Paleo Butternut Squash Lasagna? Leave them in the comments below! This is awesome! I wish there was a cheesier substitute… But still, very cool! Perhaps some nutritional yeast mixed in with the egg? I seem to have had a brain blip…meant “eggs, beaten”! Definitely put in the dish raw. Thanks for catching that. Hi Michele! I really appreciate the feedback, especially on the squash quantity. I may change the recipe a bit so that folks will definitely end up with enough. Really glad you liked it. That’s fantastic about your food pro…right on!! 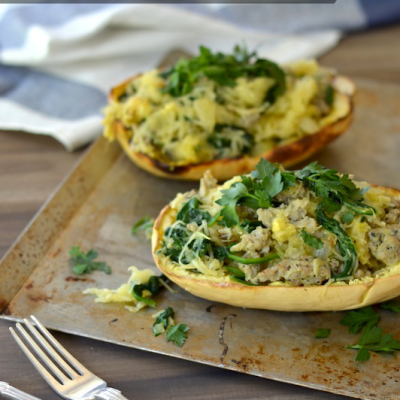 Actually, the squash ended up being plenty…it was just the egg that I could have used more of! Just ate some of the leftovers.. yum! This came out sooo good!! The flavors were perfect and I didn’t even miss the noodles. It was a hit with my guest also. Thanks for posting! Hi Carissa! That’s so great to hear 🙂 I’m glad you both liked it. Do you think that you could put this together a day in advance and store in frig with the beaten eggs?? Going to give it a whirl! Hi there! I think so…the eggs might eventually sink down to the layers below but it shouldn’t hurt the flavor. What kind of olives did you use? Hi Madeleine…pretty sure I used green olives for this one but any kind will do. I just made a meat and mushroom sauce with 1/2 beef/ 1/2 lamb. I was planning on using it to top spaghetti squash for dinner, but now I think I might have to change my plans. This looks really yummy. I’m thinking of adding a bag of spinach to the sauce and cooking it down a bit before assembling. Can’t wait to try it. Ooooooh that sounds super tasty, Renee!! The spinach is a great idea! I was thinking of adding spinach, too! 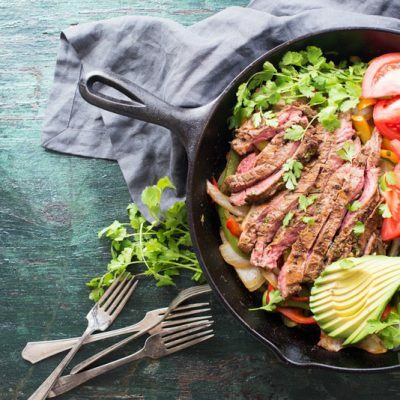 I love all-in-one dish meals – so much easier. This sound delicious! What about beating in some full fat coconut milk with eggs to achieve a more creamy ricotta- like texture for the “cheese” part if this recipe? Cathy…that sounds brilliant! I like the way you think! What kind if olives are you using in this recipe, Steph? Green ? Ripe ? Kalamata? Hi Cathy…I used green but black would be great, too. 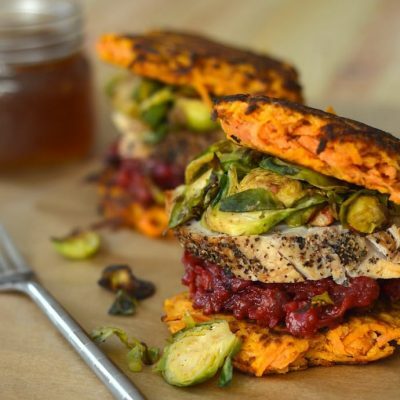 What are your thoughts about substituting sweet potato rounds for the butternut squash? I am in a small rural town in France, and there was no squash at the marche today, so I bought sweet potatoes instead! Doable? Thanks for any advice! If I cannot use olives, could you suggest how much salt I should use to replace the salt from the olives? Thank you. I would add salt to the sauce…truthfully I usually salt food by taste so see how the sauce tastes and then adjust from there. Sorry I’m not able to give you a more specific answer. This sounds delicious! I’ve been looking for something to do with butternut squash! Thinking about adding a layer of bacon. What do you think? I don’t think you could ever go wrong with that! Can this be made ahead as a freezer meal to be thawed and cooked later? Hi Jodi…I’m not really sure to be honest but I think butternut squash would hold up okay in the freezer without getting mushy. This looks amazing, but I have an allergy to eggs. How important are they/what would you recommend as a worthy replacement? Thanks in advance!! They’re there to provide the texture and appearance of cheese. Not necessary in the dish and it’d be tasty without it. Thank you, Steph! Definitely on the menu for this week! So happy I found your website! So Yummy!!! My first dinner for my Whole30. My husband a full blooded (American) Italian loves it – no need to go back to pasta and ricotta! What type of tomato sauce do you recommend? I am close to Trader Joes, Whole Foods, and Fresh Market. Thanks! Hi Andrea…any kind that has no added sugar or any other funky ingredients. I don’t routinely shop for pantry items at any of those so I’m not sure. I buy Trader Joe’s tomato sauce regularly, and it is just fine. Just eyeball those cans for sugar, sometimes they sneak in! I have made this before with great success. But, the other night, I didn’t have time, so I made it with pasta sauce, a package of cubed butternut squash and stir fried it. Just as tasty!!! I made this tonight and it tastes great. Next time I would just use half a butternut squash — I have half of it left over after cutting in the fridge and am not sure what to do with it. Also, it was unclear if the eggs were meant to be scrambled first or included raw, but I made a guess and included them raw and it was fine. The squash never did get “fork soft” even after an hour at 350 degrees, and I was very careful to cut them thin. Next time I’ll microwave the squash first. I think this was also be great with potatoes! This was super good, even without cheese (and I love cheese). Even with one medium butternut squash, it made a nice big batch. If you aren’t anti-dairy, I’m sure it would be great with some ricotta in the middle and some mozzarella on top! I am vegetarian. Can I omit meat and still get a nice lasagna? Hi there…you may want to substitute in some veggies so it has a bit more substance to it. One of my favorite go to recipes, though I just cube the squash smaller and put it all together. Have to cook a little longer but well worth saving the effort of slicing and carefully arranging. Tastes even better on day #2! Nice! I like it when people can make it their own! hi. new to the paleo stuff. (so glad I was referred to your site for recipes!!) – could you please advise what a sauce without “excess sugar” /clean sauce might look like label-wise? 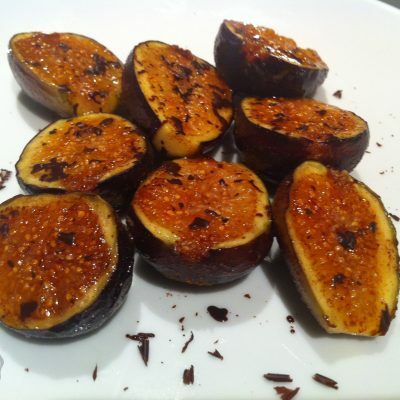 – many many thanks for your gifts of knowledge, expertise and recipes! Hey Meghan…you need a very sharp knife. Cut it while the squash is raw. Hope that helps. When I make butternut squash soup I bake the whole squash first to make it easier to cut. Since you are going to bake anyway it shouldn’t hurt the nutritional value. Does this sound like a problem to you? No that’s not a problem. Never thought to use butternut squash like this. Had a guest stop over while it was in the oven and hesitated to invite them to stay. How can lasagna without cheese and noodles taste good, right? Wrong! It was delicious and everyone wanted seconds. Thanks so much! Now I know what to do with my butternut squash. I substituted mushrooms for olives and added more salt/seasonings. 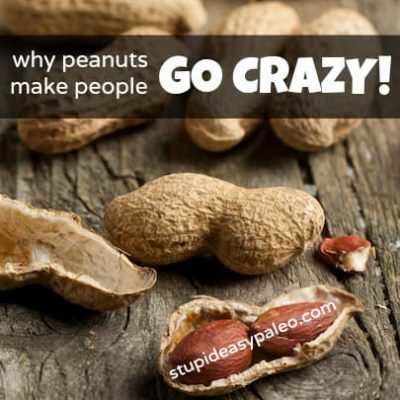 I’m allergic to eggs, wonder what I can do to replace it or maybe just try the recipe without?